To dismantle the contents of your suitcase in the middle of San Juan airport and redistribute your dirty laundry among your carry ons requires a prodigious lack of shame. My husband meekly suggested that I leave behind the wine. “Why don’t I just get rid of THESE!” I hollered, brandishing his size 13 EEE slip-on mocs like a ramper parking an airplane at the gate. It wasn’t my finest moment. I got the checked bag down to 48 pounds but we lumbered through the airport laden with bags heavier than 5-year old twins. I choose my splurges carefully when traveling. Hire a local guide to show me the sights? Yes. Enjoy an extravagant meal at a legendary restaurant? Yes. Buy a unique piece of art from a local crafter? Yes. Pay overweight baggage fees? Never! Since I’m a light packer and not a big shopper, I don’t usually land in that particular circle of Hell. However, at the end of my Caribbean adventure last year, my suitcase was busting with 3 bottles of superb French Meursault, Portugese cotton towels, and a hardcover coffee table book commemorating Les Voiles de St. Barth. The scale registered 62 pounds and the desk agent growled, “That’ll be $200.” “Over my dead body,” was the response. I may be stubborn as a stump about some things. For example, never, ever suggest that I’m driving in the wrong direction. If I’ve set a course, it’s the one we’ll follow until I drive off a cliff. However, the Luis Muñoz Marin Airport Incident taught me a lesson and I purchased a luggage scale for my trip this year. I chose the Tarriss Jetsetter (currently $19.97 on Amazon). I weighed my packed bag when we arrived and as I purchased my booty (3 Longchamp bags; assorted perfumes and anti-aging serums; and more linen, because I’m an addict) I put them in my empty suitcase and checked the weight. I arrived confidently at the counter and smiled smugly as 3 of the 5 couples in front of us battled with the agent and each other over excess baggage fees. I guess I could have bought another suitcase and paid $25 to check the extra bag, but I saved myself a bit of buyer’s remorse when the AmEx bill arrives next month. Tarriss is one of several brands of digital luggage scales; Camry, Balanzza and Air Weigh are others available on Amazon, priced in and around $20. 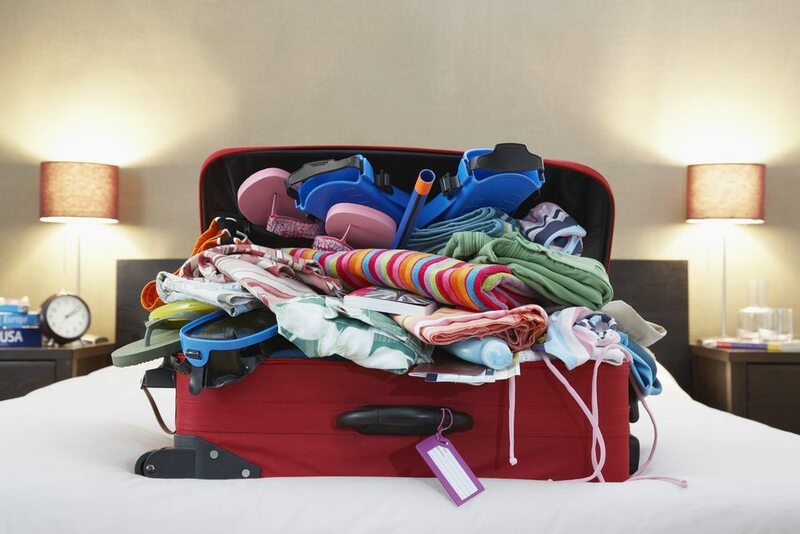 All work in the same manner – you connect an attached strap to your packed bag, reset the scale to zero and lift the bag. Hold it steady and the weight appears in the window. Et voilà! I think I should buy this. I have been lucky so far, but you never know. I always pack more underwear than I need.. This scale is a great idea! I frequently bring home several bottles of wine and one of these times I’m going to be in trouble too! Now we have to worry about their weight instead of just worrying about the bottles breaking! I’m completely with you on this one! I have stood in line behind sooooooo many people re-doing their luggage! The scale and bags that express air out of them when packed has been a lifesaver to me! Tell me more about these bags that express air out? Don’t they require a vacuum? According to Doug Dyment of onebag.com many airport luggage scales are off by 10%. So it is a good idea to have your own scale if you are travelling heavy and checking a bag. I personally like to bypass the whole thing by using international flat rate shipping to mail my stuff home. It’s available in most countries and the cost is equivalent to checking a bag. Just fill in the customs forms and off you go! The box shows up at your place a week or so later. No hassle. If I have something delicate I’ll put that in my carry on bag and mail my dirty clothes home instead. I usually stop off at the post office the day before I leave. Another great suggestion! Do international post offices have boxes and tape readily available like in the States? There are a number of luggage scales on Amazon, however, we are the only company that stands by their luggage scale with a lifetime warranty. I’ll give you a bit more praise, Todd, if you don’t mind. The design is contemporary and sleek, the display is easy to read, and the measurement was accurate, matching the airport scale within 2/10 of a pound. Great product! Thank you! And no, I certainly don’t mind the additional praise :). Accuracy was one of our pet peeves with other scales and the reason we decided to release our own scale. We put more expensive measuring components inside than most other scales do, as well we ensure each scale is individually tested for defects and accuracy before it leaves the factory. It’s probably the reason our scale a few dollars more than more others, but the overall cost quickly becomes much lower when you don;t need to replace it every year. The whole reason we started our new travel gear company is because we travel too and we got tired of dealing with substandard gear when we travel so we decided to fix it. We have a much larger line of products rolling over the next 12 months that I hope will be equally as impressive.